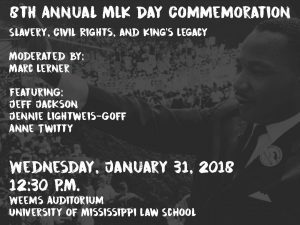 The University of Mississippi Law School will host its eighth annual MLK Day commemoration, which celebrates the life and legacy of Dr. Martin Luther King, Jr., on Wednesday, January 31, 2018 from 12:30 to 1:45 P.M. in Weems Auditorium. 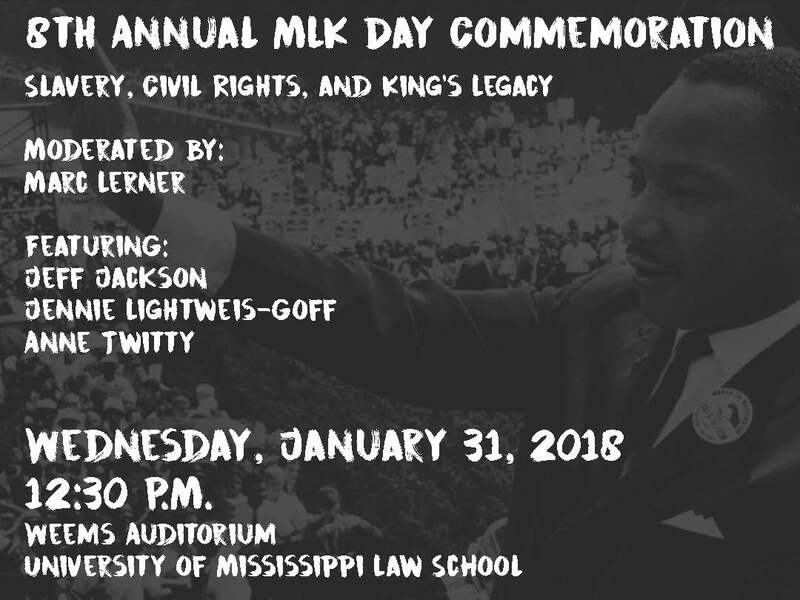 This year’s panel will focus on slavery and its connections to the legacy of Dr. King. Panelists include two members of the University of Mississippi Slavery Research Group, associate professor of sociology Jeff Jackson and associate professor of history Anne Twitty, and instructor of English Jennie Lightweis-Goff, whose work focuses on slavery, race, and southern culture. The panel will be moderated by associate professor of history Marc Lerner.